The ability to multitask and handle crisis effectively has paid off for the women workforce. Merit and talent are now being acknowledged, which was earlier confined to the four walls of the house. From veil to boardroom, Indian women have had a turbulent but interesting journey. We are mothers, sisters, wives and daughters and at the same time we are lawyers, defence officers, sportswomen, educationists, bankers, politicians, entrepreneurs and corporate leaders too. Such is the strength of Indian women. It could be a man’s world but there isn’t a man’s domain any more. Women have stepped out of their comfort zones and turning discomfort into challenges to be taken head-on. We have steadily created our space and marking it with authority. However, the progression for women has not been a cakewalk. No journey has ever been smooth…neither has been mine. I started my career as an Executive Assistant at Intex in 2001, after completing my graduation and doing a course in office automation. Fifteen years hence, my journey from Secretary to Director of Intex Technologies heading Mobiles, Consumer Durables and IT Accessories businesses has been thrilling and fantastic. I have had my shares of up and downs, trials and tribulations. There were many times when I thought of quitting … but I didn’t loose hope and stood my ground. One thing that kept me going was that I never shirked from multi-tasking, even if it meant long working hours and hard work. 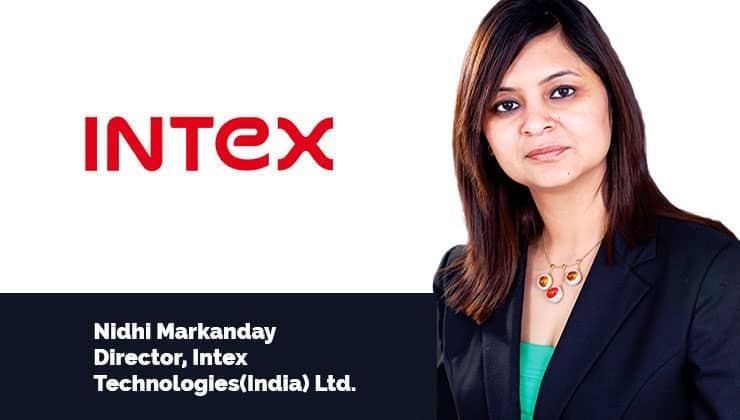 The good part was that Intex was a start-up when I joined and I found an opportunity to work across divisions – marketing, logistics, administration, HR, sales, services and so on. Under my leadership, I have been able to successfully raise the contribution of Consumer Durables business within overall Intex revenue from 15% to 35% in order to keep a balance between all verticals. With a focus on Make in India, Intex had set up its very first Manufacturing Plant for Speakers in Jammu in 2004, which last year become the largest indigenous Speaker Manufacturing Facility in India with 1.5 Million per annum capacity. After achieving success in setting up components manufacturing ecosystem for the mobile business, I am now doing the same for consumer durables category with the implementation of vertical integration in durables business starting with the launch of ‘LED Panel manufacturing’ of LED TV. The state-of-the-art LED Panels manufacturing set-up in Baddi, Himachal Pradesh will now ingenuously manufacture a critical component – LED panel (imported till now) and its accompanying parts as against just assembling them. One can say my keenness to learn and take additional responsibility took me a long way. I realized that I was good at training people and achieve results with quick execution. Further, interaction with other organisations in India and abroad helped us to reform our policies and implement the best work strategies. Also, I firmly believes in the philosophy ‘Empower your team to empower your business’. A passion to drive balance between strategy and deadlines-based execution should be part of everyone’s core approach to collaborative and visionary leadership. Being a sports enthusiast, I have been quite a go-getter. I love challenges and I have a passion to excel. Bringing up a child at home and leading a team of hundred people at office is not less than a juggling act. But then this is a skill which we all working women have learnt over the years and executing it very well too! Director, Intex Technologies (India) Ltd.
‘From veil to boardroom, Indian women have had a turbulent but interesting journey’ 1 out of 5 based on 1 ratings. 1 user reviews.